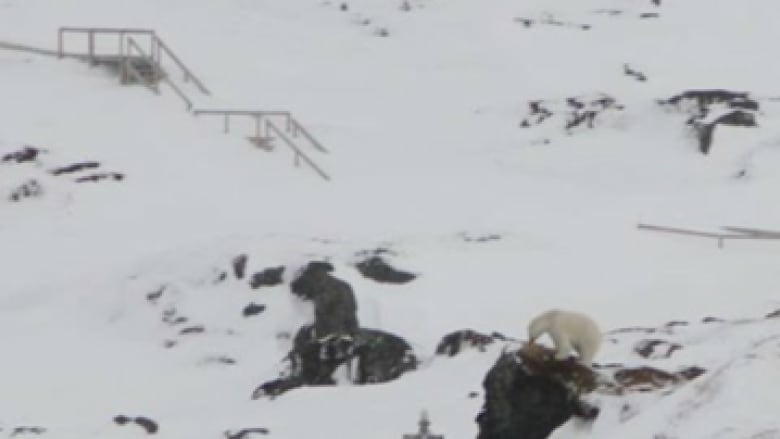 Wildlife officials are worried that people are trying to get too close to polar bears, particularly after a snowplow collided with a bear in St. Anthony earlier this week. The bear survived Monday's collision, with several people then pursuing the animal around the Northern Peninsula town. Conservation officer George Gibbons said this is a dangerous practice. "This is a safety hazard for themselves," said Gibbons. "If you're pushing a bear like that, it's [also] a safety hazard for the other people the bear may encounter." Gibbons said individuals on snowmobiles spotted the bear's tracks following the collision, and then used their machines to pursue the bear through the woods. According to Gibbons, social media makes it easier for people to chase bears for a photo. He wants to see this change. Gibbons says that if you see a bear it is best to stay calm and back away. He advises giving the bear as much space as possible, speaking calmly while walking away, and avoiding aggressive gestures. Anyone who comes across bear tracks should call the local natural resources office or the RCMP. Monday's polar bear collision is the second recent polar bear sighting near St. Anthony. On Saturday, a bear was spotted inside the town. The animal went to various fishing points, then moved south along the coast.